Our team of Instrument mechanics have many years of experience in manufacturing and rebuilding many kinds of instruments, but they usually have particular individual skills in certain areas, and we utilise this experience so that the mechanic responsible for servicing your instrument is fully conversant with it. All instruments are stripped, cleaned, worn or damaged internal parts replaced, the instrument case is then either repainted or re-plated. 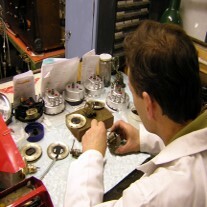 The instrument is then re-assembled and re-calibrated to the original instrument manufacturers specification. PLEASE NOTE:- During the re-building of your instrument the Odometer will normally be set to ZERO, unless we are instructed otherwise. If you require it to be re-set to the mileage on the instrument when sent to us, please indicate this mileage separately. We have a range of 'Standard' servicing charges, which are based on the type of Instrument, and subject to the Instrument being complete, with no external damage. These can be found on the various Instrument pages. If the Instrument is incomplete, has been physically damaged or prior unsuccessful or amateurish repairs attempted, we will need to see it to enable us to give you a firm quotation. 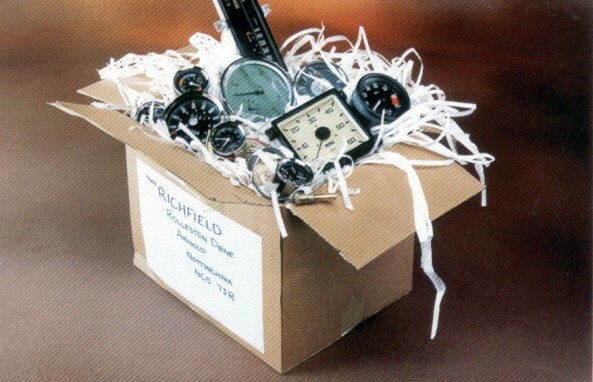 PLEASE NOTE the replacement of non-functioning instrument parts such as the Instrument case, dial, bezel, lighting, fixing straps etc, are not included in our 'Standard' servicing charges, but we can quote separately for these as required. When sending instruments to us, please retain all fixing straps, brackets, bulb-holders etc, and please ensure they are well packaged, (We regularly receive instruments that have been damaged beyond repair due to inadequate packaging). Also make sure your Full name and address is shown on the outside of the package, and also included inside with your instructions. We recommend that each instrument is wrapped in something like 'Bubble-wrap' and packaged in a stout cardboard box. Please complete our Order/Quotation form and include it with your instrument, together with copies of any correspondence/ emails etc. It would also be of assistance if you marked your name and address on the outside of the parcel. (We receive many hundreds of parcels, and unless there is positive identification with your instrument, we may not be able to relate it to any previous communications with you). You will find our pricing details and other information on the separate pages, based on the Part No. of your instrument, which you should be able to find on the dial of the Instrument. We will send you a confirmation on receipt of your instrument, showing the price and anticipated delivery time. Delivery times can vary depending on the level of work we have on hand. We will not commence work on your instrument until you have acknowledged our quotation. Before we commence work, we require payment in full. You may pay by Cheque (Drawn on a UK Bank) / UK Postal Order / Paypal / Credit card (MasterCard/ Visa only), Debit card, or Cash (Pounds Sterling (GBP), US Dollars or Euro’s only). It is recommended that cash should be sent by registered mail only. If paying by Credit Card or Debit card, we will not collect the funds until just prior to dispatch. All work is fully guaranteed against faulty workmanship or parts for 6 months from dispatch. We have tried to anticipate most enquiries you may have, but if you have any questions please email or call us. If you would rather speak to someone personally, please call us on 0115-9264235 during normal office hours. We do NOT have an automated telephone system, but if our lines are busy, please leave your message and we will get back to you as soon as we can.